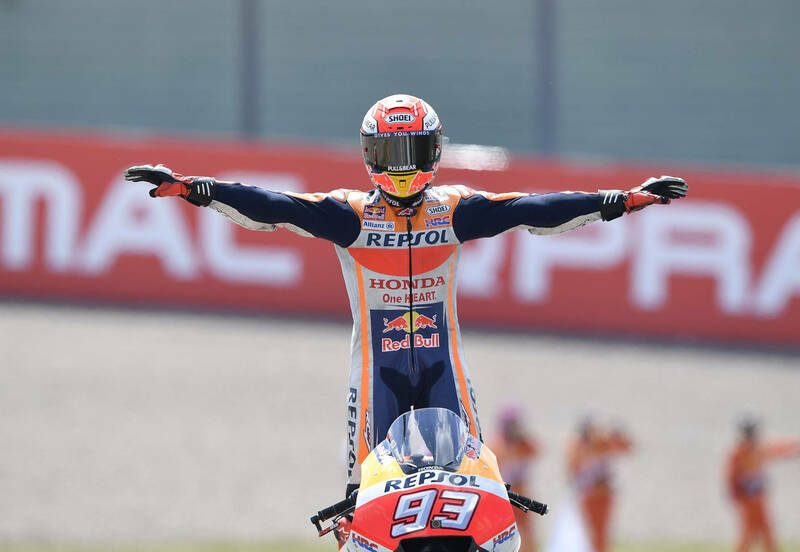 Marc Marquez (Honda) won his 9th consecutive GP race at the Sachsenring earlier today — one of the longest winning streaks in modern professional sports history. After overtaking early leader Jorge Lorenzo (Ducati), Marquez seemed to ease away from eventual second place finisher Valentino Rossi (Yamaha) with pace to spare. Maverick Viñalez (Yamaha) finished third. Marquez extends his championship lead to 46 points over Rossi. Follow this link to full race results. For additional details and points, visit the official MotoGP site. Marquez wins. Yawn. Rossi claims second and grabs his 196th premier class podium. Hurray ! You’re right. Shows just how good MM is when you get more excited about VR taking second that MM taking first. That’s actually kind of a sick burn, I gotta give you that. While I’m at it, I gotta give it to Dirck who observed (going against the grain of everyone saying just how lost Yamaha is and continues to be) that they are indeed in command once past MM. Seems like the Yamahas have picked up a bit of pace, but Dovisioso has been struggling mightily compared to how he was riding at the begining of the season as well. Jorge got the team brass off his back with those two wins, so I predict that he’ll revert back to his push for part of the race, then fade technique. He’s probably more focused on switching to Honda, at this point. -Jorge really needs to stop choosing the softest tire option that nearly always seems to make him fade back into the pack about halfway through the race. Seriously, Jorge, it’s not THAT important that you lead early in every race. -Yamaha is supposed to produce something new for their riders at Brno. They’d better. And why did they have to wait until Brno, anyway? They’ve been saying “Brno…new parts” for months. Why so slow with the new parts? The championship is basically already over now. The promised upgrades needed to arrive no later than Austin, if not by Qatar. The season is half over and all it takes is one broken bone to end a 2 race points lead. Ask Rossi. When you’re reduced to needing your opponent to miss multiple races in order for you to have a chance at the championship, your season is essentially over. The old man (Rossi) needs every advantage, no shame in that. I’m amazed he’s still out there taking risks and running up front. Marquez doesn’t break bones. Haven’t you heard? He’s had the Wolverine Adamantium skeleton implanted. More seriously, notice how he also never gets arm pump – with all that hard breaking you would think it would be worse for him. Did he already have the arm pump surgery? JL said that the problem was the rear tire, not the front one. BS – did you see how he kept missing turn 1? That’s not a rear tire issue. Of course it’s bs. How would a 5-time World Champion know anything about what is going on with his motorcycle? Maybe you can call up and let the supposed professionals know what is really going on. Unless that upgrade includes 2 MM clones, they should just grab an early lunch and call it a day. If they’re not producing a Marc Marquez to ride their bike, I’m not sure what would make the difference. Since Marc is the only rider able to consistently ride up front with the Honda, I’m saying that the Yamaha is objectively a better motorcycle. I think most people would agree that the Yamaha is objectively better than the Honda. However, I think many would also argue that Marquez is a more gifted rider than Vinales or Rossi at this point. Or at the very least, that the way the Honda needs to be ridden in order to go fast suits Marquez to the point that the combo has a distinct advantage. However one wants to look at it, I think what VLJ is saying is that Yamaha needs to produce some more advantage points from the machine in order to challenge Marquez. Because at the moment, two of the best riders in the world just don’t have anything for him despite riding “objectively better” motorcycles. More to the point, those same two riders point to the identical two issues with their machine: a lack of power, and dodgy electronics. They’re on the track, riding against the other machines. They know their bike’s strengths and weaknesses, relative to the competition. What they’ve seen over and over for over a year now are two constants: a lack of competitive acceleration, and the inability of the rear tire to hook up and stay hooked up coming out of a corner, particularly over race distance. To the latter point, they know it’s the electronics. Yamaha admits it’s the electronics. What baffles me is why is Yamaha able to promise “Brno” as the date at which point they will have upgrades? They came out with that announcement all the way back at the beginning of the season. If they were aware of the problem way back then, and how to fix it, why did they have to push the delivery all the way out to Brno? How could they have known that it would take that long…specifically, Brno. I think MM is more gifted -at certain things- than Rossi. If the Yamahas didn’t have the slight issues they have he’d be right there. I think MM might be able to do a little more right at the limit – think Senna vs. Prost for a comparison. Heh, yep – the “get out in front and control the race” strategy only works when you can make it last long enough for the rest to not eat you by the end, indeed. Well done! Short of being sideswiped by a bus, Marquez is starting to looking look like a lock on the championship. Only one close is Rossi and he won’t keep up the drive in the second half of the season. Bubba doesn’t need to be a soothsayer to come to those conclusions. More like Captain Obvious. While Rossi is closest on points, only Lorenzo has had more than a single win (beside Marquez, of course). As they say in investing, “Past performance is no guarantee of future results”, but it’s hard to envision a scenario where Marc doesn’t win. I still think we’ll see a strong battle for 2nd before the year is out.